Willow 25th Anniversary Blu-Ray Review And Giveaway - Are You Screening? Most people may not think of it this way, but there was a real golden age of fantasy films in the ’80s. While the ’80s didn’t produce tons of blockbusters, these films paved the way for a lot of bigger budgets to come in over the next 20 years. Some titles probably stand out, depending on your particular bent – The Princess Bride, Flash Gordon, Clash of the Titans, but the decade was littered with fan-favorite and cult classics. These are films that, for lovers of fantasy, make up the most honored tier of the genre. Dragonslayer, The Dark Crystal, and Ladyhawke, just to name a few, are films that are not only treasured in the hearts of millions, but tested the waters of the fantastical for a new age of cinema. Coming in at the end of the decade, George Lucas and Ron Howard came together to make Willow. Looking back, one of the most interesting things about these films is that they didn’t really have the technology to pull off the special effects they’re after. The magic and monsters were limited, and had to play second fiddle to a story, largely unlike today. By today’s standards, these films, and especially they’re dragons or other giant beasties, can seem like watching Harryhausen’s skeletons. Thus, while Willow isn’t necessarily the best story you’ve ever heard, it has a lot that connects it with some of the strongest movies to come out of the decade. Willow takes a traditional fantasy plotline, and spins new life into it with the most unlikely of heroes. 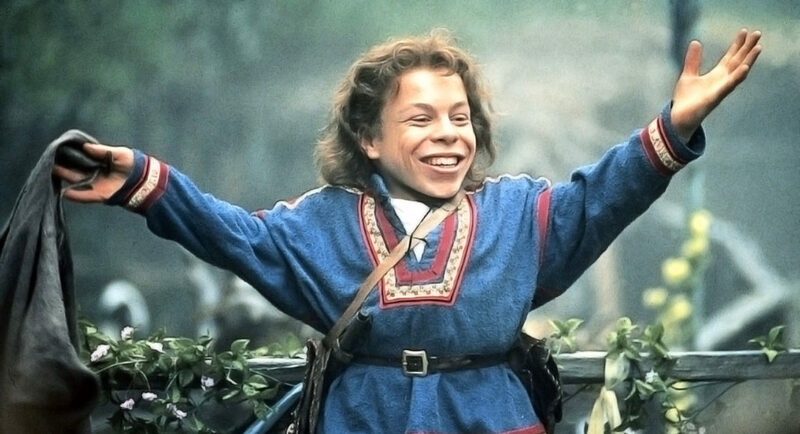 You could hardly imagine a less likely hero than Warwick Davis‘ Willow. Whether it’s armies of evil forces or a vile sorceress, you could hardly expect Willow to have the slightest idea where to go next. Throw in Val Kilmer‘s reluctant Madmartigan, and there are no heroes in the story that offer up a lot of hope. Though the special effects are mostly a curiosity by now, the story actually holds up pretty well (or at least, as well as it ever did), and the movie should easily enchant younger audiences today. The 25th Anniversary Blu-Ray is a surprising release, even given the film’s history and fan base. The digitally restored video is incredible. The film’s first ten minutes are enough to sell the video presentation, both for the good, and the curiously not so good. Wandering the semi-wilds with Willow, who has no idea what he’s in store for, we get treated to downright amazing views of the landscape. You won’t find video that better sells Blu-Ray quality. Of course, I find most of these restored releases from 20+ years ago make for a strange experience at times, and require you to let certain things go in order to immerse yourself in the vibrant video you’re seeing. For a lot of films this will come by way of “green screen” shots becoming laughably obvious, what with the high resolution and clarity making the background stand out almost as though done on purpose. Here, every nuance of special effect wizardry pops out. It’s bad enough with certain aspects – like the “trolls” in their costumes – but even less obvious bits give much of the film an “on set” feel. While the release isn’t exactly loaded with special features, it does have some new treats that make this a worthy purchase. You get a selection of deleted scenes, all of which are very cool, and they come with introductions by Ron Howard. You also get Warwick Davis’ video diary, with a bit of introduction from him, and this is a very special feature indeed. Combine this with a new introduction by Ron Howard for the featurette The Making Of An Adventure, which gives you a bit more than you expect, and there is a good bit of new material. For any fans of the film, the real treat of this release is the new footage of Ron Howard reminiscing in various ways with one of his earliest projects. Not only is it an interesting look to have him going over the special effect abilities put together for the film, which were (believe it or not) cutting edge at the time, but hearing him relive his experience with George Lucas is worth the purchase. The video diary Warwick Davis made is also much more of a sell than it might seem. While these are often fairly goofy additions when they show up on a release, this is a very young Warwick Davis, fresh from his role as an Ewok, with a personal video camera, at a time when the ability to have such things was more interesting than any old guy with a phone. Poking around the set to the point of almost becoming an irritant, his video camera became a running gag of the production. Overall, while some may hope for a bit more to an Anniversary release, don’t let the length of the special feature list fool you here. As I said, the upgrade to the video experience is a major bonus on its own, and there’s a wealth here for fans. Below check out the trailer and some additional info, and enter to win your very own copy!